Author: Anoop C Dhamangaonkar . 2/28,Madhavi Soc., Mogal Lane, Matunga (W), Mumbai-400016.India. Background: Intertrochanteric (IT) fractures are one of the most common lower limb fractures. There are many varied treatment options to treat the same. Also, our basic understanding of IT fractures is improving leading to evolution of newer concepts which in turn is leading to designing of newer implants. In this sea of newer treatment options, are all newer implants merely market driven? The new- age orthopaedic surgeon needs to be made aware of the newer concepts of IT fractures, implant designs and also a comprehensive literature support of the various treatment options available like concept of unstable IT farcture, the dynamic hip screw (DHS) system, Medoff’s plate, DHS with a trochanteric stabilization plate, 95 degree Dynamic Condylar Screw, first to third generations of gamma nails, proximal femoral nails (PFN), expandable PFN, InterTAN with integrated interlocking screws, proximal femoral locking plates and use of bipolar hemiarthroplasty. This article also aims to present a practical treatment algorithm for the treatment of IT fractures, but this may not be generalizable to all orthopaedic surgeons. Keywords: Intertrochanteric; unstable; DHS; PFN; Gamma; hemiarthroplasty. Intertrochanteric (IT) fractures are disabling injuries that most commonly affect the elderly population and also in young. The incidence has increased significantly during recent years due to the advancing age of the world’s population. These fractures were managed by conservative methods before 1930s when the age of fixation began. Through this article we wish to present the gradual yet sudden transition in various treatment modalities. Till the third decade of the twentieth century trochanteric fractures were treated conservatively. Conservative treatment regimes included, simple support with pillows or splinting to the opposite limb, Buck’s (skin) traction, Well-leg traction, plaster spica immobilization, Russell’s balanced traction and skeletal traction through the lower femur or upper tibia. Nonsurgical treatment of intertrochanteric hip fractures is not preferred but is usually reserved for patients with comorbidities who are not fit for anesthesia. Mortality after non-operative treatment is commonly due to cardiopulmonary complications, thromboembolism, and sepsis . In 1989, Hornby et al compared the nonsurgical treatment with a dynamic hip screw (DHS) in 106 patients with intertrochanteric hip fracture . There was no significant difference in complications, 6-month mortality, pain, leg swelling, or pressure sores. SHS group gave better anatomic reduction and a shorter hospital stay. Patients treated conservatively had greater loss of independence at 6-month follow-up. The authors recommended surgical treatment for medically stable patients. A 1981 prospective trial of 150 patients compared nonsurgical treatment (ie, skeletal traction with a tibial pin) with surgical treatment . The authors concluded that excellent results with traction alone could be obtained provided a good nursing care was maintained with careful attention to bedside physical therapy, respiratory care, deep vein thrombosis prophylaxis, and prevention of ulcers. A 2003 retrospective study reviewed a population database to compare mortality rates in patients with severe comorbidities who were treated either nonsurgically or surgically for intertrochanteric hip fracture . It concluded that the mortality rate was low in the conservatively treated patients provided the patients were mobilized early out of bed to chair. The evidence-based literature supports surgical fixation while also providing valuable information in regard to medically unstable patients who must be treated nonsurgically [2-4]. During the early 1950s when the use of Smith Peterson nail and Jewett nail-plate was very common, W. Schumpelick et al. revolutionized treatment of IT fractures by presenting the results of the sliding neck screw of the DHS in 1955 . Here any force acting on the femoral head in the direction of the body axis will be diverted by the sliding neck screw into the direction of the axis of the screw, so that it strikes the fracture line approximately at a right angle and acts not as a shearing but as a compressing force stimulating callus formation. Here too varus collapse, shortening, superior cut-out occurred. But in non-union was rare. What is an unstable intertrochanteric fracture? Stable intertrochanteric fracture implies that the reduction is stable with a lesser tendency to collapse further post-operatively. Whereas the unstable IT fractures have a tendency to collapse much more post-operatively, especially in varus and retroversion. Fractures with a large posteromedial void, reverse oblique fracture configuration, IT fractures with subtrochanteric extension and IT fractures with a lateral wall fracture [6-10]. Two major modifications to the DHS are the Medoff’s plate and the DHS with a trochanteric stabilisation plate. In 1991, Medoff et al used a new axial compression screw plate device for unstable intertrochanteric or proximal subtrochanteric fractures of the hip with no technical failures . The device has an axial compression screw to allow compression along an axis parallel to the femoral shaft. As the fracture settles postoperatively, dynamic axial compression continues. In 1993, Babst et al. stated that the lateralisation of the greater trochanter could be prevented in all cases with a trochanteric buttress plate being added to the sliding screw-plate . This also leads to a limitation of telescoping, with less shortening even with immediate full weight bearing. Leung F et al concluded that the DHS blade plate was an effective fixation option in elderly osteoporotic patients with intertrochanteric fracture femur where the conventional lag screw was replaced with a helical blade . Here, the helical blade leads to better blade fixation in osteorotic bone by impaction of the cancellous bone while insertion rather than destroying bone while reaming for the DHS lag screw. 95 degree DCS or angle blade plate is often used to treat the reverse oblique intertrochanteric fractures as they biomechanically mimic the subtrochanteric fractures. Rosso R et al recommend that the DCS may be used to treat subtrochanteric fractures rather than intertrochanteric fractures . 1. To reduce the varus strain on the implant while weight bearing by reducing the force arm. 2. To provide a lateral buttress with an IM device to prevent the lateralization of the proximal fragment and control the collapse rather than relying on the integrity of the lateral wall. Bridle et al in 1991, prospectively compared the dynamic hip screw and the gamma nail in100 intertrochanteric fractures in elderly patients . They found no difference in the operating time, blood loss, wound complications, and stay in hospital or the patient’s mobility. But fractures of the femur in 4 cases were seen in the gamma nail group which required further revision surgery. Leung KS et al in 1992conducted a randomized study in elderly patients comparing gamma nails and dynamic hip screws and concluded similar final outcome with both, but achieved less surgical trauma, less screening time, less blood loss and earlier rehabilitation with gamma nails . Radford PJ et al prospectively compared the Dynamic hip screw and the Gamma nail for fixing 200 peritrochanteric femoral fractures in elderly patients . There was less intraoperative blood loss and a lower rate of wound complications in the patients treated by the Gamma nail. They however had a high incidence of femoral shaft fractures which were related to the implant design. They did not recommend the use of the Gamma nail for these fractures. Curtis MJ in 1994 assessed the rigidity and strength of fixation provided by intramedullary and extramedullar devices for proximal femoral fractures . Stable and unstable intertrochanteric fractures were studied after fixation with Gamma nail and DHS implants. There was no significant difference in the strength of fixation of stable and unstable intertrochanteric fractures between the Gamma nail and the hip screw, although the Gamma nail provided more rigid fixation. In 2001, Adams CI et al prospectively compared the IM nailing with a DHS and side plate in 400 patients . Revision rates, femoral shaft fractures, and lag screw cutout were slightly higher in the IM nailing group but not statistically significant from the DHS cohort. There was no difference in the early or 1 –year functional outcomes. Ahrengart L et al randomized 426 intertrochanteric fractures to be fixed with either the Gamma nail or a compression hip screw . The surgical time was not significantly different between the two groups. In the Gamma nail group, difficulty was encountered with the distal locking technique. The incidence of cephalic position of the compression screw within the femoral head, screw cutout, and intraoperative fracture were higher in the Gamma nail group. Walking ability was the same in both groups. The authors recommended compression hip screws for less comminuted fractures, reserving Gamma nails for comminuted patterns. Utrilla AL et al compared the Gamma nail with a compression hip screw in 210 stable and unstable fractures and found no difference in total surgical time . However, the Gamma nail group had a significantly lower postoperative transfusion requirement. Mortality, fracture healing, and intra- and postoperative complication rates were not significantly different between the two groups. In patients with unstable fracture patterns, postoperative ambulation was significantly improved in the Gamma nail group. The Preference to the use of Gamma nail for unstable IT fractures after early 2000 was primarily due to the introduction of second generation Gamma nail called the Trochanteric Gamma Nail (TGN) and the third generation Gamma nail called the Gamma3 Nail (G3). Better implant design led to decreased fracture shaft femur, which was the complication seen in early generation Gamma Nail . The G3 proximal diameter is 15.5 mm, 1.5 mm smaller than TGN (17 mm). G3 design also allows distal dynamic locking screw. But the migration resistance in G3 is lesser than TGN. The main reason for this is the smaller diameter in the G3 lag screw measuring 10.5 mm rather than 12 mm in the TGN . The latest edition to the G3 design is the Gamma3Rotational Control, with the addition of a spreading U-Clip over the cephalic screw which increases the surface area and also the resistance to failure . Clinical studies report better results with G3. Varela-Egocheaga JR et al reported 2 cases of cutout and 1 screw protrusion in 40 patients (7.5%) in a series comparing G3 with an extramedullary device . Andruszkow H et al reported that a TAD should not exceed 25mm and a valgus reduction reduces the chances of screw cut-out . de Grave PW et al  reported 2 cases of mechanical failure in 61 patients treated with a Gamma3 nail, and Westacott D and Bould M  reported no case of mechanical failure in 36 unstable proximal femoral fractures treated with a long Gamma3 nail. Mingo-Robinet J et al stated that there was no relationship between cutout rate and TAD in TGN and G3 . Though they concluded that Gamma3 Nail has higher cutout rates than TGN in unstable fractures. In 1996, AO/ASIF developed the proximal femoral nail (PFN) as an intramedullary device for the treatment of unstable per, inter and subtrochanteric femoral fractures. Pajarinen J et al compared the DHS with a proximal femoral nail (PFN) in 108 patients and the main outcome measure was recovery of ambulation . The patients treated with IM devices had a significantly faster return to preoperative ambulation levels. Nuber S et al evaluated 129 patients with unstable intertrochanteric fractures treated with either a DHS or a PFN . Revision rates were similar between the two groups. However, there was a significantly shorter surgical time, shorter hospital stay, earlier full weight bearing and lesser pain intensity at 6-months post-op in the PFN cohort. Zhang K et al stated in a meta-analysis of six studies including 669 intertrochanteric fractures that the PFN group had significantly less operative time, intraoperative blood loss and length of incision than the DHS group . There was no significant difference in the postoperative infection rate, lag screw cut-out rate, or reoperation rate between the PFN and DHS groups. They concluded stating that PFN is a better implant than DHS. PFNA-II is the modified PFN design meant to match the Asian proximal femoral morphometry. Expandable PFN was designed to retain the mechanical characteristics of a large-diameter nail, to provide the good torsional stability between the femoral neck and shaft obtained by an expendable peg inserted in the femoral head (especially in cases of poor bone quality), and to avoid the need for interlocking screws. However its long term utility needs further literature support. Elis J et al concluded that the expandable PFN was at least as good as the 95 degree DCS after comparing the EPFN and the 95 degree DCS . Jin YM et al concluded that expandable PFN are better implants than DHS and anatomic plates in treating intertrochanteric fractures . This is a newer intra-medullary fixation device which uses proximal intergrated interlocking screws in a figure of eight position to attain compression of the intertrochanteric fracture site. Wang Q et al compared the InterTAN and the DHS and concluded that InterTAN significantly reduces the operative time, intra-operative radiation exposure, intra-operative blood loss and postoperative complications . The InterTAN can be used in elderly osteoporotic patients and in and unstable intertrochanteric fractures. Jiang Y et al stated that a proper pre-operative imaging, reaming is essential before inserting the InterTAN . But an open reduction and internal fixation with DHS be preferred in cases where the reduction is difficult. Nüchtern JV et al concluded that the InterTAN with two integrated screws was able to withstand higher loads than the Gamma 3 nail . Many new designs of proximal femoral locking plates have been used to treat intertrochanteric fractures. But there is not enough literature evidence of they being better than IM implants. Haq RU et al concluded that PFN is a better implant than reverse-distal femoral locking plate for intertrochanteric fractures with a deficient lateral wall . Zhong B et al stated that the proximal femoral locking plates were better for treating subtrochanteric fractures rather than intertrochanteric fractures . Azboy I et al concluded that both proximal femoral locking plate and 95 degree angle blade plate gave equally good results in reverse oblique intertrochanteric fractures. However, angle blade plates were preferred as they were an economical option . Dhamangaonkar AC et al compared the Proximal femoral locking plate with the DHS. They concluded that proximal femoral locking plates decreased the chances of limb shortening and medialisation of the shaft . A recent study by Shen J et al concluded that these plates are an effective and safe method in the treatment of all types of intertrochanteric femoral fractures, but good fracture reduction and ideal positioning of the neck screw are prerequisites for the success of the device . Prosthetic hip replacement generally has not been considered a primary treatment option for intertrochanteric fractures. In this setting, prosthetic replacement for intertrochanteric fractures typically requires a more complex surgical procedure to reconstruct the calcar and trochanters with potentially higher morbidity. In the patient with preexisting symptomatic degenerative arthritis and in extremely comminuted osteoporotic intertrochanteric fractures, primary prosthetic replacement may be a better option . Kim Y et al studied 143 hips in 139 octagenarians who underwent a cementless bipolar hemiarthroplasty for intertrochanteric fractures concluded that cementless bipolar hemiarthroplasty appears to be a suitable method for the treatment of intertrochanteric fracture in octogenarians . And recommended that stable fixation of the posteromedial fragment is necessary to avoid stem subsidence. Emami M et al studied 60 patients with IT fractures, compared bipolar hemiarthroplasty and DHS fixation and concluded that in elderly patients with co-morbidities, bipolar hemiarthroplasty was more effective than DHS with better functional status, however there was no difference in pain severity between the two groups . Cankaya D et al compared the functional outcome of cementless versus cemented hemiarthroplasty in 86 elderly patients and concluded that cementless hemiarthroplasty was better in terms of duration of surgery, amount of blood loss and perioperative mortality rates than in the cemented group . But Shen J et al categorically stated after studying 124 patients above 70 years of age, that Internal fixation is preferred as it leads to a higher Harris scores, lesser pain, and better walking ability than those treated with hemiarthroplasty provided there is good and stable reduction, even when severe osteoporosis is present . Tang P et al, after retrospectively studying 303 patients concluded that PFNA was superior to hemiarthroplasty according to the operative statistics, especially the anaesthesia, operation lasting time, blood loss, blood transfusion and the drainage, but there were no significant differences in functional outcome . But the incidences of complications were higher in hemiarthroplasty group. Hemiarthroplasty may still find favor in cases with fracture comminution in elderly with severe osteoporosis or in cases with failed fixation of intertrochanteric fracture . More definative evidence will be needed to stratify the patients who would be benefitted by hemiarthroplasty. The American Academy of Orthopaedic Surgeons (AAOS) presented a Clinical Practice Guidelines (CPG) on the management of hip fractures after reviewing above16,000 abstracts and above 1700 full-text articles and came out with 25 evidence-based recommendations. We present here a summary of the same . Apart from the operative decision, the recommendations do suggest important practices like avoiding delays to surgery, decreasing delirium, initiate postoperative physical therapy, nutritional, calcium and vitamin D supplementation and evaluation of osteoporosis. The next important determinant affecting the operative plan, is the IT fracture configuration- whether stable or unstable. There is equal evidence for the use of either intramedullary implants or sliding hip screws in the treatment of stable intertrochanteric fractures. Though the newer generation orthopaedic surgeonsprefer the use of IM implants due to its percutaneous insertion, lesser operative time and blood loss. Though, the cost of implant, comfort and training of the surgeon determines the choice of implants. There a strong recommendation to use the IM implants for the unstable IT fractures, especially the ones with a subtrochanteric extension and reverse oblique fracture configuration. There is however not enough literature to suggest use of short or long IM implants and further studies are required to determine the outcome of each. The most important determinant of treatment of IT fractures is whether the fracture is stable or unstable and advantages of the newer implant designs available to treat IT fractures. Stable fractures may be fixed with either intra-medullary or extra-medullary implants. The treatment of unstable IT fractures needs meticulous pre-operative planning, good intra-operative reduction and use of intra-medullary implants. The surgeon is free to use any design amongst the many intra-medullary implants as per the training and experience of the surgeon. There is as yet no consensus in literature regarding whether to use short or long IM nails. As far as possible fixation of IT fractures is to be attempted rather than a hemiarthroplasty. 1. Parker MJ, Handoll HH: Conservative versus operative treatment for extracapsular hip fractures. Cochrane Database Syst Rev 2000; 2: CD000337. 2. Hornby R, Evans JG, Vardon V: Operative or conservative treatment for trochanteric fractures of the femur: A randomized epidemiological trial in elderly patients. J Bone Joint Surg Br 1989; 71:619-623. 3. Bong SC, Lau HK, Leong JC, Fang D, Lau MT: The treatment of unstable intertrochanteric fractures of the hip: A prospective trial of 150 cases. Injury 1981; 13:139-146. 4. 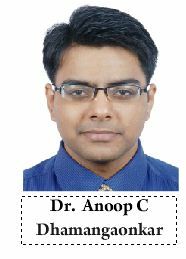 Jain R, Basinski A, Kreder HJ: Nonoperative treatment of hip fractures. Int Orthop 2003; 27:11-17. 5. Schumpelick W, Jantzen PM. A new principle in the operative treatment of trochanteric fractures of the femur. J. Bone Joint Surg. Am. 1955; 37; 693-698. 6. Aktselis I, Papadimas D, Fragkomichalos E, et al.. Intramedullary nailing of trochanteric fractures–operative technical tips. Injury. 2012;43:961–965. 7. Haidukewych GJ, Israel TA, Berry DJ. Reverse obliquity fractures of the intertrochanteric region of the femur. J Bone Joint Surg Am. 2001;83-A:643–650. 9. Gotfried Y. The lateral trochanteric wall: a key element in the reconstruction of unstable pertrochanteric hip fractures. Clin Orthop Relat Res. 2004;425:82–86. 10. Palm H, Jacobsen S, Sonne-Holm S, et al. ; Hip Fracture Study Group. Integrity of the lateral femoral wall in intertrochanteric hip fractures: an important predictor of a reoperation. J Bone Joint Surg Am. 2007;89:470–475. 11. Medoff RJ, Maes K. A new device for the fixation of unstable pertrochanteric fractures of the hip. JBoneJoint Surg Am. 1991;73:1192-1199. 12. Babst R et al. The DHS (dynamic hip screw) buttress plate in the management of unstable proximal femoral fractures. Schweiz Med Wochenschr. 1993;123:566-568. 13. Leung F , Gudushauri P, Yuen G, Lau TW, Fang C, Chow SP. Dynamic hip screw blade fixation for intertrochanteric hip fractures. J Orthop Surg (Hong Kong). 2012;20:302-306. 14. Rosso R , Babst R, Marx A, Hess P, Heberer M, Regazzoni P. Proximal femoral fractures. Is there an indication for the condylar screw (DCS)?. Helv Chir Acta. 1992;58:679-82. 15. Bridle SH, Patel AD, Bircher M, Calvert PT . Fixation of intertrochanteric fractures of the femur. A randomised prospective comparison of the gamma nail and the dynamic hip screw. J Bone Joint Surg Br. 1991;73:330-334. 16. LeungKS , So WS, Shen WY, Hui PW. Gamma nails and dynamic hip screws for peritrochanteric fractures. A randomised prospective study in elderly patients. J Bone Joint Surg Br. 1992;74:345-351. 17. Radford PJ, Needoff M, Webb JK. A prospective prolonged comparison of the Dynamic hip screw and the Gamma locking nail. J Bone Joint Surg 1993; 75 : 789-793. 18. Curtis MJ, Jinnah RH, Wilson V. Proximal femoral fractures: A biomechanical study to compare intramedullary and extramedullar/ fixation. J Bone Joint Surg 1994; 25 :99-104. 19. Adams CI, Robinson CM, Court-Brown CM, McQueen MM: Prospective randomized controlled trial of an intramedullary nail versus dynamic screw and plate for intertrochanteric fractures of the femur. J Orthop Trauma 2001; 15:394-400. 20. Ahrengart L, Törnkvist H, Fornander P, et al. : A randomized study of the compression hip screw and Gamma nail in 426 fractures. Clin Orthop Relat Res 2002; 401:209-222. 21. Utrilla AL, Reig JS, Muñoz FM, Tufanisco CB: Trochanteric gamma nail and compression hip screw for trochanteric fractures: A randomized, prospective, comparative study in 210 elderly patients with a new design of the gamma nail. J Orthop Trauma 2005; 19:229-233. 22. Mingo-Robinet J, Torres-Torres M, Martínez-Cervell C, Alonso Del Olmo JA, Rivas Laso JA, Aguado-Hernández Het al. Comparative study of the second and third generation of gamma nail for trochanteric fractures: review of 218 cases. J Orthop Trauma. 2015;29:e85-90. 23. Varela-Egocheaga JR, Iglesias-Colao R, Suarez-Suarez MA, et al.. Minimally invasive osteosynthesis in stable trochanteric fractures: a comparative study between Gotfried percutaneous compression plate and Gamma3 intramedullary nail. Arch Orthop Trauma Surg. 2009;129:1401–1407. 24. Andruszkow H, Frink M, Frömke C, et al.. Tip apex distance, hip screw placement, and neck shaft angle as potential risk factors for cut-out failure of hip screws after surgical treatment of intertrochanteric fractures. Int Orthop. 2012;36:2347–2354. 25. de Grave PW, Tampere T, Byn P, et al.. Intramedullary fixation of intertrochanteric hip fractures: a comparison of two implant designs. A prospective randomised clinical trial. Acta Orthop Belg. 2012;78:192–198. 26. Westacott D, Bould M. Outcome in 36 elderly patients treated with the Gamma3 Long Nail for unstable proximal femoral fracture. Acta Orthop Belg. 2011;77:68–72. 27. Pajarinen J, Lindahl J, Michelsson O, Savolainen V, Hirvensalo E: Pertrochanteric femoral fractures treated with a dynamic hip screw or a proximal femoral nail: A randomised study comparing post-operative rehabilitation. J Bone Joint Surg Br 2005; 87:76-81. 28. Nuber S, Schönweiss T, Rüter A: Stabilisation of unstable trochanteric femoral fractures: Dynamic hip screw (DHS) with trochanteric stabilisation plate vs. proximal femur nail (PFN) [German]. Unfallchirurg 2003; 106:39-47. 29. Zhang K, Zhang S, Yang J, Dong W, Wang S, Cheng Y et al. Proximal femoral nail vs. dynamic hip screw in treatment of intertrochanteric fractures: a meta-analysis. Med Sci Monit. 2014;20:1628-33. 30. Elis J, Chechik O, Maman E, Steinberg EL. Expandable proximal femoral nails versus 95° dynamic condylar screw-plates for the treatment of reverse oblique intertrochanteric fractures. Injury. 2012;43:1313-1317. 31. Jin YM , Chen JP, Li XL, Huang YZ, Yang D. [Retrospective study of comparing the different internal fixation methods in treating intertrochanteric fracture of femur]. Zhongguo Gu Shang. 2008;21:329-332. 32. Wang Q , Yang X, He HZ, Dong LJ, Huang DG. Comparative study of InterTAN and Dynamic Hip Screw in treatment of femoral intertrochanteric injury and wound. Int J Clin Exp Med. 2014;7:5578-5582. 33. Jiang Y, Li J, Dib HH, Li YC.Implantation of INTERTAN™ nail in four patients with intertrochanteric fractures leading to single or comminute fractures: pitfalls and recommendations: a case series. J Med Case Rep. 2014;8:383. 34. Nüchtern JV, Ruecker AH, Sellenschloh K, Rupprecht M, Püschel K, Rueger JM et al. Malpositioning of the lag screws by 1- or 2-screw nailing systems for pertrochanteric femoral fractures: a biomechanical comparison of gamma 3 and intertan. J Orthop Trauma. 2014;28:276-282. 35. Haq RU , Manhas V, Pankaj A, Srivastava A, Dhammi IK, Jain AK. Proximal femoral nails compared with reverse distal femoral locking plates in intertrochanteric fractures with a compromised lateral wall; a randomised controlled trial. Int Orthop. 2014;38:1443-1449. 36. Zhong B , Zhang Y, Zhang C, Luo CF. A comparison of proximal femoral locking compression plates with dynamic hip screws in extracapsular femoral fractures. Orthop Traumatol Surg Res. 2014;100:663-668. 37. Azboy I, Demirtaş A, Gem M, Cakır IA, Tutak Y. A comparison of proximal femoral locking plate versus 95-degree angled blade plate in the treatment of reverse intertrochanteric fractures. Eklem Hastalik Cerrahisi. 2014;25:15-20. 38. Dhamangaonkar AC, Joshi D, Goregaonkar AB, Tawari AA. Proximal femoral locking plate versus dynamic hip screw for unstable intertrochanteric femoral fractures. J Orthop Surg (Hong Kong). 2013;21:317-322. 39. Shen J, Luo F, Sun D, Huang Q1, Xu J, Dong S et al. Mid-term results after treatment of intertrochanteric femoral fractures with percutaneous compression plate (PCCP). Injury. 2015;46:347-357. 40. Parker MJ, Handoll HH: Replacement arthroplasty versus internal fixation for extracapsular hip fractures. Cochrane Database Syst Rev 2000; :CD000086. 41. Kim Y, Moon JK, Hwang KT, Choi IY, Kim YH. Cementless bipolar hemiarthroplasty for unstable intertrochanteric fractures in octogenarians. Acta Orthop Traumatol Turc. 2014;48:424-430. 42. Emami M , Manafi A, Hashemi B, Nemati A, Safari S. Comparison of intertrochanteric fracture fixation with dynamic hip screw and bipolar hemiarthroplasty techniques. Arch Bone Jt Surg. 2013;1:14-17. 43. Cankaya D, Ozkurt B, Tabak AY. Cemented calcar replacement versus cementless hemiarthroplasty for unstable intertrochanteric femur fractures in the elderly. Ulus Travma Acil Cerrahi Derg. 2013;19:548-553. 44. Shen J, Wang DL, Chen GX, Yang HL, Li L, Wei MX et al. Bipolar hemiarthroplasty compared with internal fixation for unstable intertrochanteric fractures in elderly patients. J Orthop Sci. 2012;17:722-729. 45. Tang P, Hu F, Shen J, Zhang L, Zhang L. Proximal femoral nail antirotation versus hemiarthroplasty: a study for the treatment of intertrochanteric fractures. Injury. 2012;43:876-881. 47. Roberts KC, Brox WT.From Evidence to Application: AAOS Clinical Practice Guideline on Management of Hip Fractures in the Elderly. J Orthop Trauma. 2015;29:119-120. How to Cite this article: Dhamangaonkar AC. Management Options and Treatment Algorithm in Intertrochanteric Fractures. 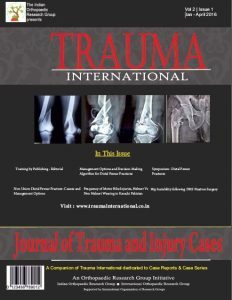 Trauma International July-Sep 2015;1(1):12-16.